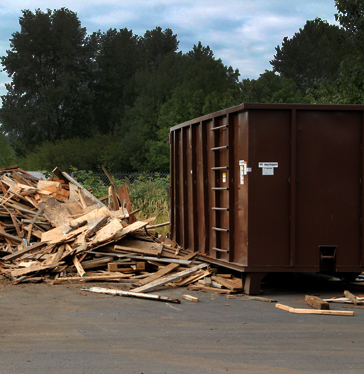 Hudson Garbage Service offers 20, 30 and 40 yard drop box (roll-off) rentals for big projects in Clatskanie and Rainier. For smaller projects, Hudson Garbage Service also offers short-term 2 yard roll-off rentals in Clatskanie, Columbia City, Deer Island,Rainier, St Helens and Warren. Columbia County business, commercial and industrial customers with bulky, non-compactible wastes such as paper, sawdust, wooden crates and many other materials are effectively serviced by Hudson Garbage Service’s roll-off container systems. These containers are also useful for construction sites, including residences with a large amount of demolition and construction-related debris (remodeling). The high-capacity steel boxes used in this waste collection system can be hand-fed with large 7-foot rear doors that will accommodate fork lifts for depositing extremely bulky or heavy materials. Full roll-off containers can be hauled and returned or replaced with an empty one by Hudson Garbage Service on a predetermined schedule or on an as needed basis.